An A4 prior to launching from the aircraft carrier HMAS Melbourne. The Douglas A4 Skyhawk was designed for aircraft carrier operations with the US Navy and US Marine Corps as a small attack aircraft with high load carrying capacity. The prototype first flew on 22 June 1954. The Royal Australian Navy ordered eight A4-G fighters and two TA-4G trainers from the US which were accepted on 26 July 1967. The aircraft were brought to Australia in the aircraft carrier HMAS Melbourne and subsequently landed in Jervis Bay from where they were transferred to nearby NAS Nowra. 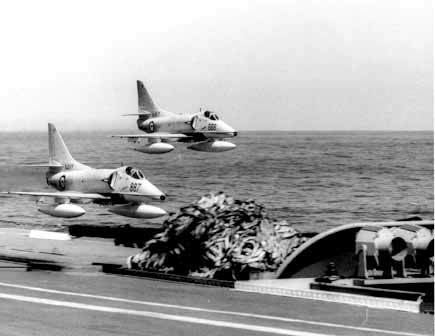 A pair of Skyhawks perform a low flypast of HMAS Melbourne. The 8 fighter aircraft were allotted to VF 805 Squadron whose primary roles included air defence, maritime strike and support to the Army when configured in land attack role. The Skyhawks proved to be both formidable and versatile aircraft with the ability to carry large weapon pay loads. An in-flight refueling capability enabled them to extend their radius of action to press home coastal and shipping attacks far from their parent aircraft carrier HMAS Melbourne. Following the initial order for ten air-frames an additional ten A4-F variants were procured from the US Navy and brought up to A4-G standards prior to delivery in 1971. Altogether ten of the the aircraft were lost between 1973 and 1980 highlighting the inherent risks associated with naval aviation. Following the de-commissioning of HMAS Melbourne in 1982 the remaining ten Skyhawks were withdrawn from service and sold to the Royal New Zealand Air Force (RNZAF) in 1984. 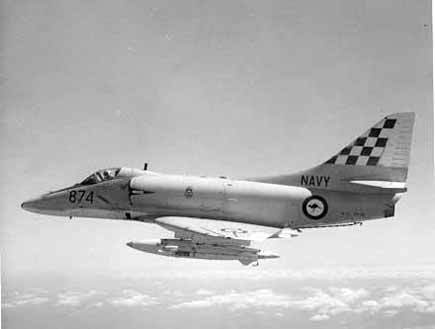 For a number of years 2 Squadron RNZAF operated these Skyhawks, from HMAS Albatross, and provided training support to the RAN by conducting 'attacks' against ships operating in the East Australian Exercise Area. These training evolution's were renowned for their intensity and were pressed home at quite low altitudes. 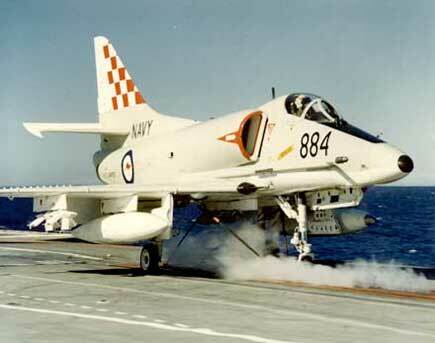 2 Squadron ceased operations at Nowra in January 2002 and returned to New Zealand. Examples of both the Skyhawk A4-G and TA-4G may be found on display at the RAN Fleet Air Arm Museum located at HMAS Albatross, Nowra, NSW. 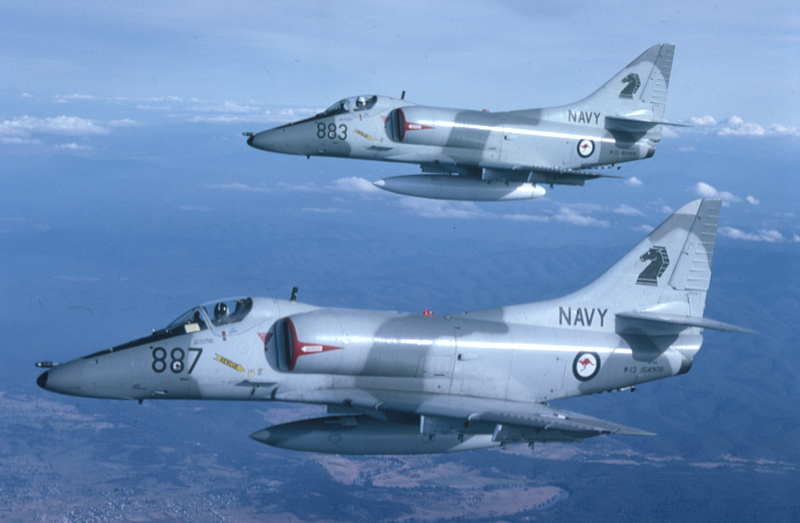 Two A4-G Skyhawks in formation, circa 1981.